Along with the clarinet, the piano is my favorite instrument, and the piano concerto is my favorite form of classical music. I love to be in the audience of a concert at Jones Hall with the great Houston Symphony Orchestra when there is a piano concerto on the program. There are so many beautiful piano concerto movements, it is hard to pick out the most beautiful of them all. But the Tales, daring to go where no man has gone, will attempt to choose the top six most beautiful movements in the piano concerto repertoire. Of course, this is the Tales' opinion of the top 6 and not meant to be a consensus of classical music experts, whom I certainly do not include myself anywhere near that category. In choosing the top 6, I came up, probably by no accident, with five of my favorite composers. These five composers just happen to be some of the greatest composers in classical music: Chopin, Mozart, Beethoven, Rachmaninoff and Mendelssohn. 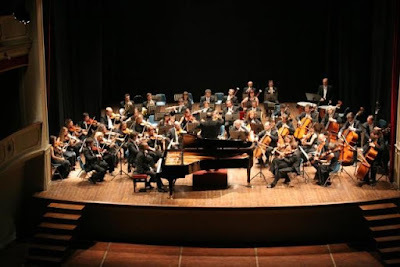 Please turn up the volume and enjoy 'the Tales' top 6 most beautiful piano concerto movements. I think at least some of them may be included in your favorites.